Restaurateur in Paradise: Matthew Greenbaum, executive chef at the Underwood, has gone to great lengths to get the place opened with partner Sally Spittle. Call Graton the Sonoma County restaurant graveyard. Kitchen, Cafe Dahlia, Cape Fear, Passion Fish, and the Downtown Bakery and Cafe, all of which once served hearty meals here, are all history. But Graton is also home to the Willow Wood Market Cafe, which opened in 1995 and is still dishing out polenta, its trademark. Now the Willow Wood has genuine gastronomical competition for the first time ever from a rival across the street--the Underwood Bar and Bistro, which opened Dec. 30, 2002. If the faces look uncannily familiar, that's because the Underwood's proprietors--executive chef Matthew Greenbaum general manager and Sally Spittles--are also the Willow Wood's proprietors. On first glance, it might seem foolhardy to operate not one but two restaurants in a town where restaurants seem doomed to extinction. And to open a bistro and serve European-style comfort food, like so many other North Bay restaurants, could appear to be a bad business venture, but not to Greenbaum and Spittles. "Running a restaurant is definitely a risky business," Greenbaum says at the Underwood's bar, where he's sipping an Iron Horse Pinot Noir and eating a steak with pomme frites--quintessential bistro food. "We've sunk a lot of money into this place, and I suppose people could stop coming here. But after the first six weeks, we're doing far better than anyone expected." For restaurants everywhere, tonight--Valentine's Day--is the busiest night of the year, except for Mother's Day. At the Underwood at 9pm, the bar is crowded and there isn't a free table in the dining room. Three hours later, at midnight, when Greenbaum is busy counting the night's receipts, the place has thinned out, but the party isn't over yet. Customers are still drinking and eating. Some of them will stay until 2am. That late-night closing time on Fridays and Saturdays adds to the mystique of the place and has already made it a destination on the restaurant circuit in the North Bay. Jack Stuppin, the venture capitalist and landscape painter, lives close by, and he's been to the Underwood half a dozen times since it first opened. "New restaurants have very high failure rates," he says. "Restaurants that make it have one of the highest rates of return on invested capital of any business. So when you make it, you make it very big." From Stuppin's point of view, the Underwood seems likely to succeed despite the downturn in the economy. "Everything about the place is artistic," he says. "It's pleasing to the visual palette and to the countercultural sensibility of the West County. It also appeals to establishment types." With folks like Jack Stuppin talking up the Underwood, it's not surprising that the proprietors haven't yet advertised. The menu has elements of both a California-tinged bistro (ahi tuna, oysters, lamb stew) and a tapas bar (anchovy crostini, Spanish tortilla)--probably the two biggest food crazes of the past few years. The Underwood is about as hip as a restaurant can get, though Greenbaum and Spittles insist that they don't give a hoot about trends and fads. "I dislike pretentious talk about food and wine," Greenbaum says. "And I dislike pretentious places like the French Laundry, where I feel I'm supposed to applaud every dish and every move the waiters make." David Brooks, author of Bobos in Paradise: The New Upper Class and How they Got There and a regular commentator on News Hour with Jim Lehrer, would probably describe the Underwood as a paradise for bourgeois bohemians--bobos for short--the folks who drive Volvos, drink lattes, and listen to National Public Radio. Folks like me, in fact, and maybe folks like you. Many of the people who come to the Underwood to see and be seen fit Brooks' bobo profile. They're artists like Claude Smith, real estate agents like Carey Fargo, and artist/capitalists/philanthropists like Jack Stuppin. The top chefs from all the big-name restaurants in the county--Stella's to Lolo's--have been here to eat too. The Underwood boasts bohemian ambiance and bourgeois prices. A martini is $6.50. Oysters on the half shell are $22 a dozen. A grilled hamburger is $10.50--$4 more if you add cheese and bacon--and it's a better burger, too, than the burgers that were served in this very spot when it was Skip's Bar a decade ago. People who have avoided the Willow Wood for years because they've thought of it as déclassé plunk down big bucks at the Underwood bar. "The wine crowd loves it here," Greenbaum says. The bar, the list of wines, and the expensive bottles of imported Cognac, Armagnac, and Calvados are impressive. What's impressive about the whole place is the attention to detail--from the elegantly designed menus by Bee Urquhart to the nickel-plated bar itself, and from the tile work in the state-of-the-art kitchen to the copper tabletops in the dining room. The Underwood was an expensive work-in-progress for almost two years--a lot longer than anyone expected, largely because Spittles and Greenbaum wanted perfection every step of the way. Spittles insisted on holding a series of New Age and feng shui rituals to bless the place, and Greenbaum insisted on becoming the general contractor and learning the construction business from the bottom up. "At first we were just going to remodel, but we decided to gut the place," Greenbaum says. "The county slowed us down with rigmarole and we had to raise more money than we expected." Spittles and Greenbaum took out loans and appealed to family for financial help. Greenbaum's parents invested. So did his stepfather, George Segal, the Hollywood actor who starred in Who's Afraid of Virginia Woolf? (as well as Who Is Killing the Great Chefs of Europe? ), and who has become a familiar face at the Underwood. For Spittles and Greenbaum, there are dozens of details to attend to everyday. "I'm an errand boy and a general fix-it guy," he says. "Today I had to buy extra bread, negotiate with AWOL employees, and wash dishes because the dishwasher hadn't done them right." The proprietors also get enormous help from the staff. 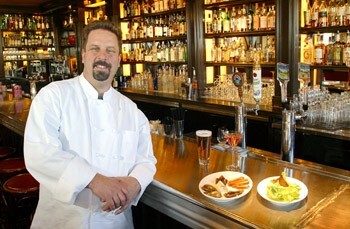 Mark Miller, the sous chef and kitchen manager at the Underwood, turned out gourmet meals for years at the Willow Wood. Bill Roberts, Underwood's executive manager, put in 14 years at Stars in San Francisco. And Frank Dice, the bartender with a tattoo of John Coltrane on his shoulder, served his apprenticeship as a manager and waiter at the Bohemian Cafe in Occidental until it went under. "I love this place," Dice says. "It's everything I wanted the Bohemian to be, and more. It has a 1950s feel to it. Six nights a week I get to dress up in black like I'm in the Mafia." Yes, the Underwood is a paradise for bobos. It's also a magical space where no matter how much money you have, or how much money you're prepared to spend, you can play whatever part you want in your own movie. You can make believe that the Underwood is almost anywhere, anytime: a New York Mafia hangout in the 1950s, a Paris Bistro from the 1940s--or the pub of a hotel in Ireland in the 1920s. "An Irish woman walked in here and was knocked over with nostalgia," Skittles says. "The Underwood reminded her of an old hotel in Belfast. If we conjure up memories like that in our customers, I'll be very happy, and they will be too." The Underwood is open Tuesday-Thursday, 4pm-midnight, and Friday-Saturday, 4pm-2am. 9113 Graton Road, Graton. 707.823.7023.